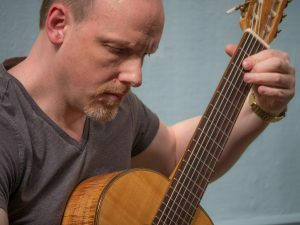 Richard Harding from the Liverpool Guitar Society has been on Radio BBC Merseyside this afternoon to talk about the LightNight Liverpool 2017 appearance of some of our members together with the Liverpool Composers Group (starts approx. minute 35). You get the opportunity to listen to his guitar playing giving you an impression what you can look forward to this Friday. Richard and two other of our members will take part in a performance at 8pm in the Atrium of the Central Library (William Brown St, Liverpool L3 8EW) on 20th May 2017. This is a performance of newly composed and specially selected pieces by Liverpool-based composers and musicians around the notion of Time; exploring the experience of listening, the memory of melodies, cultural interpretation of time and its relation to scientific definition.